The project’s main thesis is that the increasing importance of (in)security discourses in urban development can be traced back to the confluence of two overriding phenomena/processes: 1) City life has always been an encounter with strangers. In the convergence of day-to-day regimes, otherness opens up a margin of freedom as anonymity. At the same time, however, urban life is also a confronting of otherness in terms of an uncertainty—which then emerges as the desire for a “secure” order—about the outcome of an encounter; 2) Experiences of otherness in urban life intersect with postmodern social trends: fragmentation, individualization, and globalization. The perception of increased individual insecurity furthers the development of spaces of insecurity in big cities. At the same time, cultural encounters are reinforced as “perception of cultural difference”; for example, through migration. Discourses on (in)security and urban development are a global phenomenon but nevertheless differ from country to country. Different social concepts of the government’s responsibility mean that the new security politics for this purpose is established as rather centralized or decentralized, and respectively by public or private means. One of the main priorities for this project lies in the comparative analysis of nationally linked (in)security discourses and the question of how these are concretely translated into the material and social organization of city life. Glasze, Georg Robert Pütz, and Manfred Rolfes (Eds.) 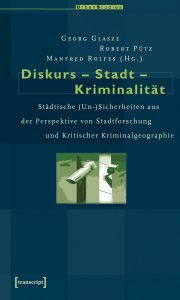 (2005): Diskurs-Stadt-Kriminalität. Städtische (Un-) Sicherheiten aus der Perspektive der Stadtforschung und Kritischer Kriminalgeographie. Bielefeld. Glasze, Georg (2007): (Un-) Sicherheit und städtische Räume. In: GEBHARDT, HANS (Eds. ): Geographie. Physische Geographie und Humangeographie. Heidelberg, P. 880-888. Schreiber, Verena, and Robert Pütz (2005): Un- Sicherheitsdiskurse. In: Themenheft: Grenzräume- Raumgrenzen. P. 329-340. Pütz, Robert, Georg Glasze (2004): Varsovie - Logement sécurisé: un marché en hausse. In: Urbanisme No. 337.